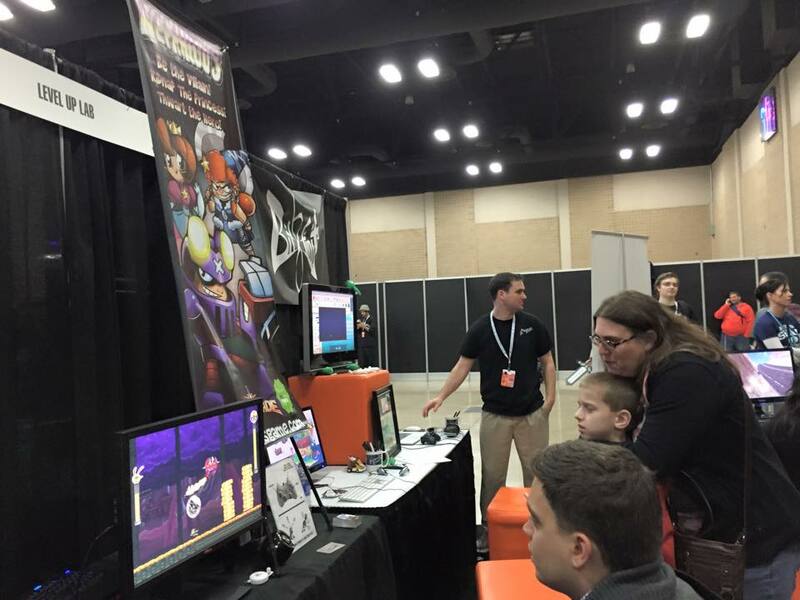 PaxSouth was our first time exhibiting a playable demo of our game, Nefarious, the game where you get to play a bad guy, and your objective on each stage is to kidnap a princess. 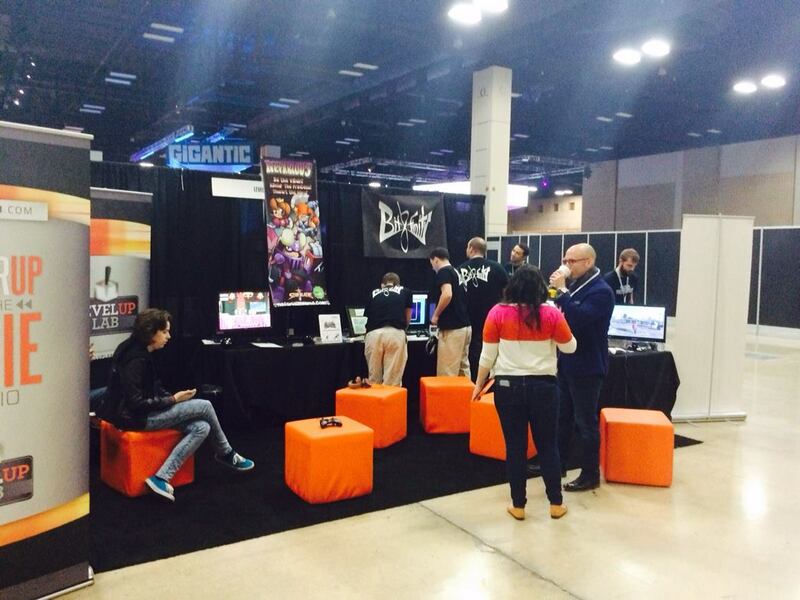 The booth was graciously provided by our incubator program Level up Labs. The event was overall immensly positive. I had feared going into the exhibit that the days would be marked with our team sitting around as our game went unplayed. What we weren’t prepared for however, was a queue of people that wanted to play the game that seemed to never end until the expo hall closed. Here are some of the top mistakes we made and what others can learn from our experience. 1. We weren’t prepared for success. This was by far the biggest problem. We didn’t know what the turn out would be, though we expected it to be big. 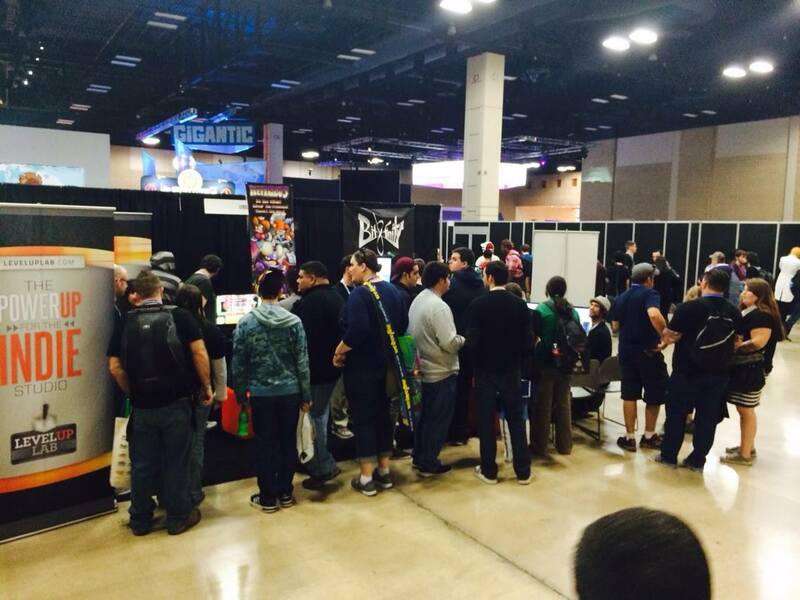 What we didn’t expect was that it was going to break the record for the biggest turn out for a first year pax. 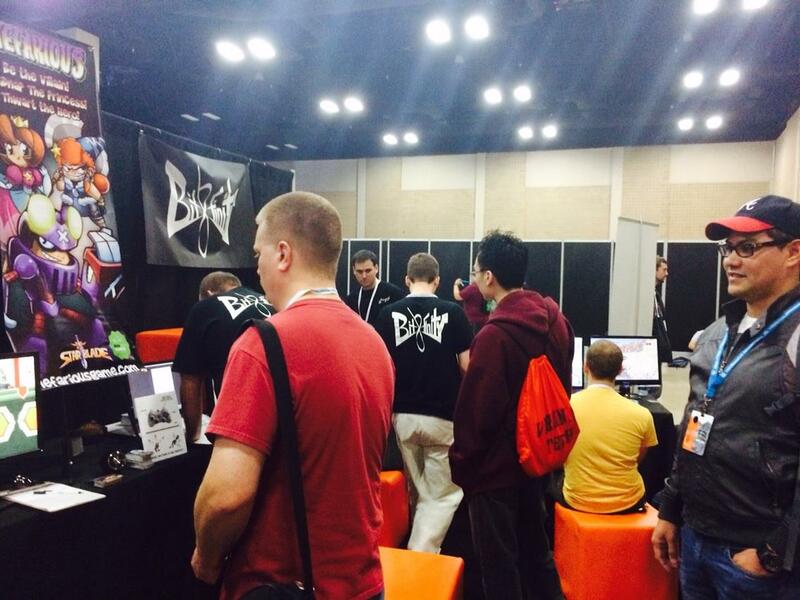 So there was a combination of large audience, plus a lot of people really liked our game! This was the root of our problem because it branches out to create the other obstacles we faced. 2. There was no limit on play time. This ended up being a big problem. People didn’t want to put our game down. 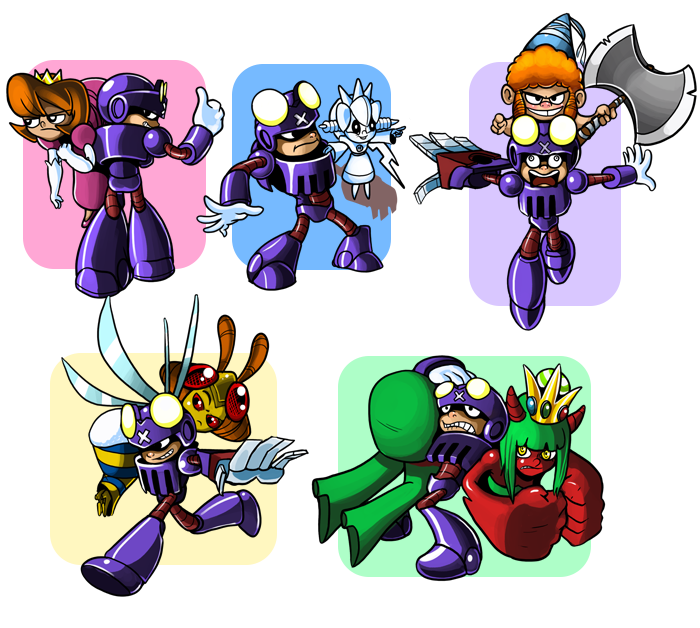 Throughout Nefarious we have various small goals the player can accomplish before they set out to complete the next. First, reach the princess. Second, escape with her. Third, thwart a hero. It was a basic three act structure that was really keeping people motivated to keep going. Once you couple that with the fact that our game is fairly difficult; it was taking the average player thirty minutes to beat a stage. This wasn’t working. That meant someone would have to stay in line for an hour if two people were ahead of them. This caused a lot of people to wait and watch, but ultimately leave. We needed to get the average play time down to five to ten minutes tops. What could we do to fix this? We discussed adding a timer that gave them an allotted time to beat the level. But then we decided what would work best is a convention only three-life system. That way it would let the player dictate the pace without adding an imposing restriction. If they died, they would feel like it was their own fault instead of being something they had no control over. 3. We only brought one station to play at. We thought a single station would be enough. But, during the convention I kept thinking how awesome it would be if we could accomodate more than a single player at a time. The math would add up really quickly. If we got our average play time down to five or ten minutes, with two stations; We wouldn’t have had nearly as many people who had to wait in line and ultimately step out due to the length of play time. Simple fix, just set up a second place to play. 4. We didn’t bring water and cough drops. You should have an elevator pitch for your game but the preparation doesn’t stop there. You need to be ready for the ordeal of giving that pitch to hundreds of people in a loud room with a lot of background noise and what it will do to you. It will take its’ toll on your speaking apparatus. Water at conventions is pricey. (3$ a pop) And you will go through it very quickly. Bring your own twelve pack of water and keep it under the table and nurse it throughout the entire convention and pop cough drops as neccesary. By the second day your mouth will feel like the Sahara. That’s when we went out and got our own water so we wouldn’t be at the mercy of the nearby concession stand. But we should have had it on day one. 5. We didn’t bring enough business cards. Foolishly, I thought one hundred cards was enough. That was a mistake. We ran out of cards near the beginning of the second day. We met tons of other exhibitors, press, streamers and even just fans who wanted to stay in touch. And it really bites to meet that exhibitor or streamer you’re a fan of, and you have nothing to give them except a scrap of paper with your email hastily written onto it with a pen. I now believe the magic number of cards needed is five hundred. With that many cards, we could have some left over when the convention is over. Then when we replenish for the next show, we’ll need to buy a little less. So long as your stock hovers around that number I think you’re well prepared for the convention. 1. We had a polished game experience. Nefarious is by no means complete. At the time of this writing we’ve only begun development three and a half months ago. Considering our illustrated backgrounds and classically animated characters, it takes a while to get things done. So Instead of getting a quanity of multiple stages, we focused on the quality of a single stage and tried to ensure the complete experience could be found there. It was our vertical slice, and our goal was to make it appear as though we took a section out of what must be a completed game. This sometimes meant creating the illusion that a system was completely implemented. When in reality our goal was to simply show what we wanted to do. Such as our grading system for how well someone does in a stage. It kept track of how long it took to get through a level, how many times the player had to respawn. It just didn’t store it anywhere. This is fine for conventions, since these players don’t necessarily care whether their run-time was recorded. They just want to see what the game is all about, what it does and how it plays. 2. Logistically, we were prepared. Theres a lot of little things that can go wrong with your booth space and we had answers for almost all of it. We had a box that had everything we could possibly need to not only make sure our presentation was up to snuff, but also allowed us to be good neighbors with our boothmates and nearby exhibitors if they needed anything. Suction cup hooks, sharpies, vinyl rope, zip ties, duct tape, bobby pins, scissors, tylenol, and tums. We had all the basics. If someones sign fell down? Duct tape and zip-tie it back into place. Someone need an impromptu sign? Sharpies, scissors and duct tape. Have a headache from that PAX day one after party? Tylenol. We also brought ample snacks so we could stay where we wanted to be (at our booth) longer before needing to go to lunch. Though I found there was precious little time to sit down and eat. 3. We had a large banner featuring our art. 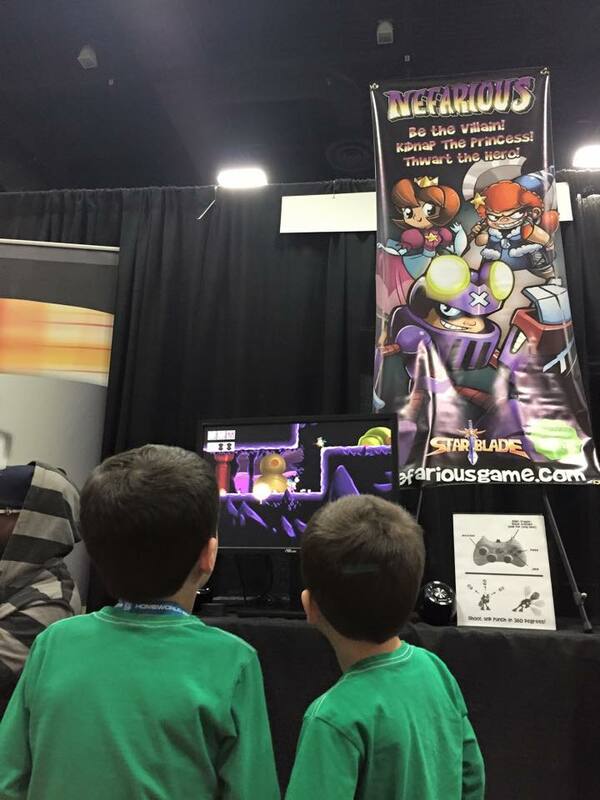 This one might seem obvious, but I saw a few exhibitors who didn’t have a banner to give people passing by an impression on their game. They only had a laptop and a controller. We received several comments from people that they saw our banner and liked the art. It created curiosity and gave a very brief impression on what sort of game it was. I think having some kind of banner should be an absolute must-have. It also helps make your booth look less sterile, and more inviting. Even with all the people who didn’t get to play because of long play-times, they at least got to see our banner. 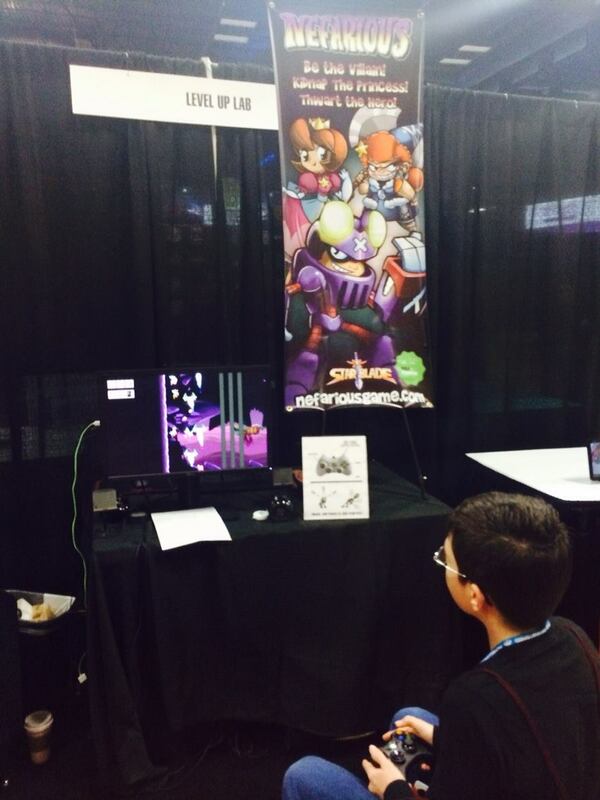 So hopefully when they see it again, they’ll recognize it as a game they wanted to check out at Pax. As you can see below, we made sure to make it elevated. So others could see it above the crowd. 4. We had a way to let people know about our game later. We took down email addresses of everyone who seemed interested in the game. This was invaluable. With such a tight budget (50,000 from our Kickstarter) nearly all of our funds go into development rather than advertising. So it’s very important for us to have a method of directly contacting our fans when we’re a little closer to launching our full title. A lot of people have this belief that they’ll just happen to run across your game when it launches; but since you probably aren’t EA or Valve, they have to count on randomly checking steam on the day you happen to launch and show up under new releases. We recorded our emails with old-fashion clipboard and paper. But for future conventions we will mostly certainly get a security cord for a tablet device and let people enter their email digitally. This would have saved us hours of transcribing several hundreds of emails with varying degrees of legibility. Spending money to save time is almost always a worthwhile investment. 5. We networked with other exhibitors. But we also networked with other studios. Many of which who are perfectly willing to share the contact info of their contractors, voice actors, artist, programmers. Therefore increasing the pool of talent you have easy access to. Also it’s just a great way to make like-minded friends. 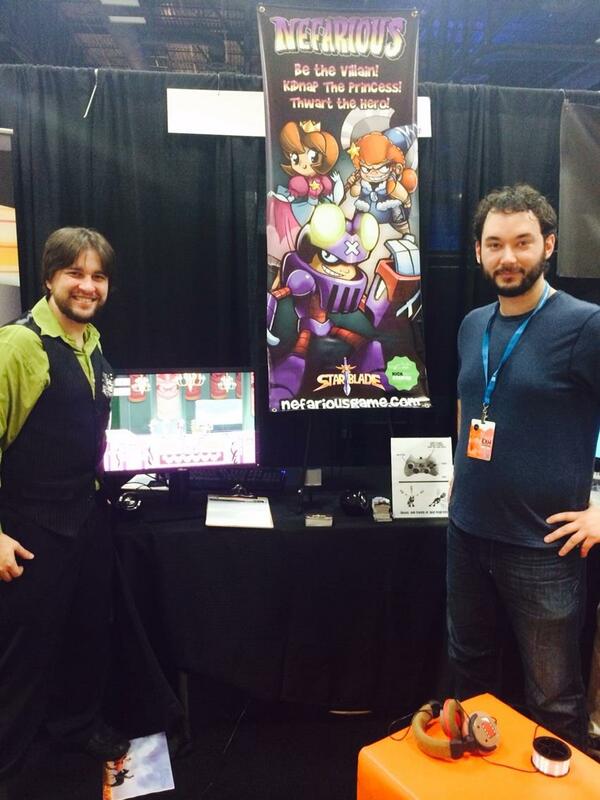 So there you have our five things we did right and wrong at PaxSouth. 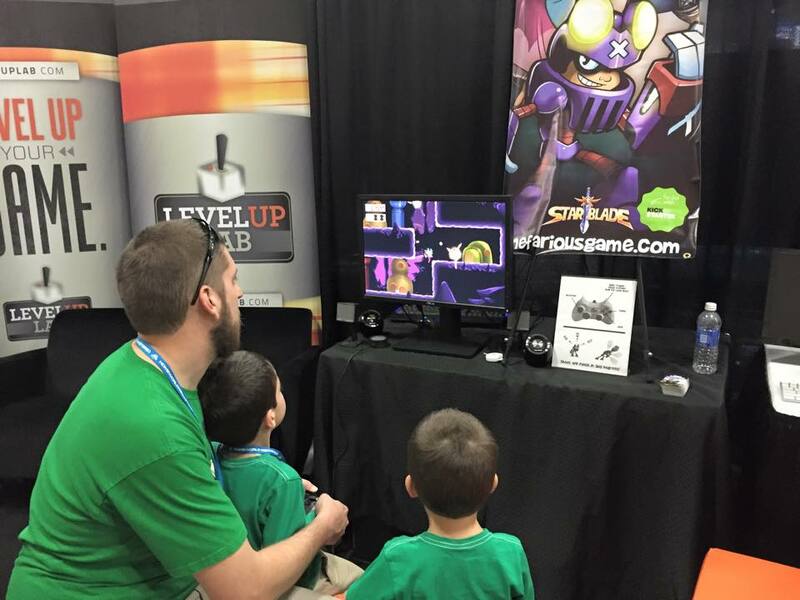 We hope that if you are preparing to exhibit your indie game, that our list has been of use to you and perhaps illuminated an aspect of your set up you haven’t considered. And I would be remiss if I didn’t tell you a little about our project for those who stuck it out the entire article. 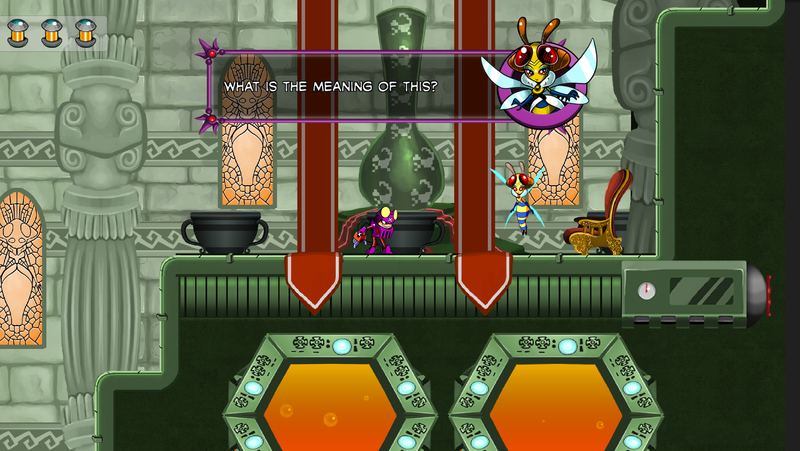 Nefarious is the game about being a villain. Your goal in each stage is to kidnap a princess, and thwart a hero. Each princess has a different effect on your movement in some way. At the end of each stage we have what we call reverse boss fights. Where instead of being the small hero fighting a big guy who takes up the entire screen. You become the guy who takes up the entire screen trying to squash a little hero. At its’ core it’s about inverting the ‘rescue the princess’ trope. But at the same time, dissecting it, and really taking a closer look at it. It was funded on Kickstarter at the beginning of October with a goal of $50,000 and has already been greenlit on steam. Our goal is to have it available for PC, Mac, Linux and Wii U at launch. Our website can be viewed at www.nefariousgame.com where we have a press-kit, updates and slacker backer options for those who may want to snag our last few Kickstarter exclusive rewards. Josh Hano is the project lead, animator and illustrator on Nefarious.